Busy week for live music and very busy week for new recordings. Here is, at least, one event that ties performance and CD together. 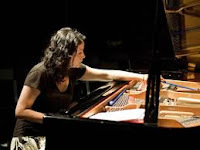 Pianist and composer Kris Davis comes to New Haven this Friday to perform two sets with fellow pianist Craig Taborn in the acoustically delightful Firehouse 12, 45 Orange Street. 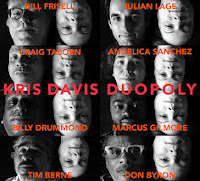 On the same day and on her own label, Ms. Davis releases an album of duets titled "Duopoly" (Pyroclastic Records), that features the pianist in musical conversation with not only Mr. Taborn but also Bill Frisell (guitar), Julian Lage (guitar), Angelina Sanchez (piano), Billy Drummond (drums), Marcus Gilmore (drums), Tim Berne (alto saxophone), and Don Byron (clarinet). Sharp-eyed readers will realize how important "Two" is to the project in that 1) - it's an album of duos, 2) - she plays 2 pieces with each musician, and 3) - out of the 16 tracks, there are two that are "standards." More about that below. This performance marks the fifth time Ms. Davis has appeared in the Elm City venue and the sixth for Mr. Taborn. Both are intelligent improvisors, without fear, and can follow any path at the drop of a beat. All of which says they are fearless. 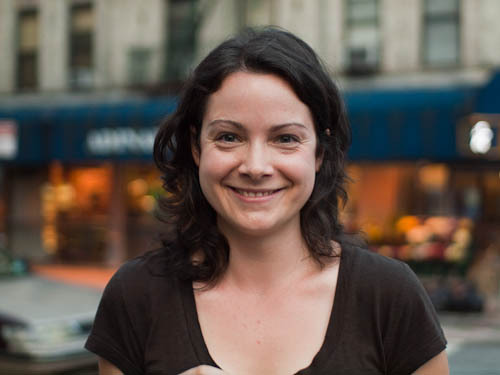 Both lead busy lives as band leaders - Ms. Davis with her trio as well as with Paradoxical Frog while Mr. Taborn also leads a trio - and both have impressive "sideman" credentials. The Davis-Taborn duo will play two sets, with the first starting at 8:30 p.m., the second at 10 p.m. For ticket information, go to firehouse12.com or call 203-785-0468. To find out more about Ms. Davis and her musical endeavors, go to krisdavis.net. "Duopoly" is an series of conversations between the musicians. 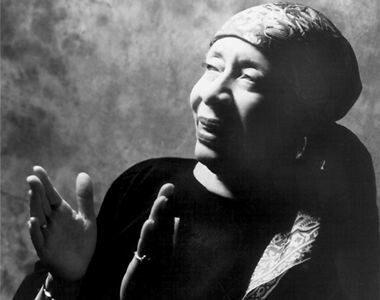 Ms. Davis composed five of the initial duos with one each by Ms. Sanchez, Thelonious Monk, and Duke Ellington. The other eight tracks are improvisations, each with the title of the musician the pianist is paired with and, in a circular twist (if that's possible), goes in the opposite order as the composed performances (Bill Frisell plays on track #1 and #16, Julian Lage on #2 and #15, and so on). 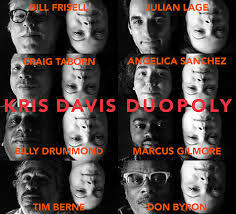 The project pairs Ms. Davis with musicians she had played with but never recorded with as well as with others she had, in her own words, "only admired". The optimum approach to this music is to just sit back and listen. As knowledgable listeners, we have expectations of each musician on this album, all of whom have recorded in groups small and large. We cannot help but be judgmental yet the fun of the recording is not only the compositions that Ms. Davis creates for each person but also how they interact in the improvisations. For instance, Mr. Drummond sounds just a bit tentative as they move through the opening moments of Monk's "Eronel" but he gets into the spirit of the duo by first following the pianist's lead then pushing her forward. The duo's improvisation piece builds off Ms. Davis's left hand and Drummond's increasingly powerful floor tom rhythm pattern. Marcus Gilmore gets into the spirit quicker, perhaps from his experiences with Vijay Iyer. His improvisation with the pianist has more sizzle and power, seeming too short at 3:34. "Trip Dance For Tim" is one of the more powerful works in the program, the throbbing piano chords supporting Berne's pointillistic forays into the upper range of the alto sax. Their "improv" features the saxophonist creating a percussive pattern on the keys of the saxophone and a breathy lead-in to his squealing, mewling, solo in a fiery interaction. The four tracks with Ms. Sanchez and Mr. Taborn cover a lot of territory with the former's "Beneath the Leaves" featuring a stubborn melody but a flowing yet angular solo. The quiet "improv" with the latter pianist stand out for its quiet poetry, a musical haiku in the midst of odes. "Surf Curl" combines a percussive, nervous, piano figure with the stately steel-string guitar of Lage. As the piece continues, he plays longer lines; listen as the piano figures moves from the lower half to the upper keys, the result being Lage occasionally strumming a chord. It's quite a treat to hear Bill Frisell in a "free-er" mode, hearkening back to his work with John Zorn and Paul Motian. Not that he goes wild but listen as he wraps his country-style riffs around the impressionistic circular piano phrase in the opening half of "Prairie Eyes" before the pianist moves into a more Americana mode. Their improv closes the album in a dream-like collection of single-note piano fills and long guitar tones, slowly easing to a quiet close. Kris Davis and producer David Breskin also filmed the proceedings which is included in the CD package. Watching the musicians obviously gives you a better feel for their interactions and it's educational to observe the creative process. "Duopoly" is an aural adventure for the mind that gives one fresh insights into the ever-expanding imagination of its creator and her compatriots. For more information, go to krisdavis.net. Meanwhile, The Side Door Jazz Club in Old Lyme continues its string of impressive weekends of music. On Friday (9/30), pianist and composer Hector Martignon comes to the Shore Line venue with his band, Foreign Affair. The Colombian-born leader has studied and recorded a number of different styles of music ranging from classical to Afro-Latin to Caribbean to Brazilian and more. The band he's bringing include two percussionist, Mino Cinelu and Samuel Torres, both amazing players, plus bassist Rudyck Vidal and vibraphonist Christos Rafalides. Foreign Affair takes the stage at 8:30 p.m. and will play two sets. For more information, go to thesidedoorjazz.com. To learn more about Mr. Martignon, go to hectormartignon.wordpress.com. 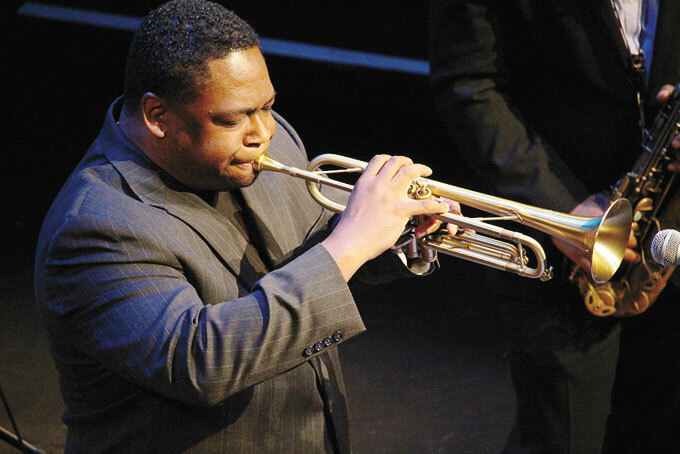 October begins on Saturday night and what better way to usher in the new month than with the Jeremy Pelt New Quintet. 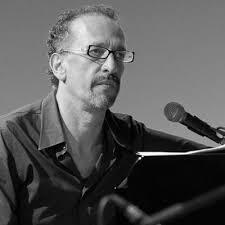 Pelt, a trumpeter, composer, and educator (currently on the faculty at the University of Hartford/Hartt School,) remains one of the busiest musicians on the planet (go to his website and check out the "Appearances" page. His latest High Note CD, "#Jive Culture", is a return to acoustic jazz and features legendary bassist Ron Carter as well as pianist Danny Grissett and drummer Billy Drummond. Mr. Pelt's new band includes the splendid bassist Vicente Archer, the fine young pianist Victor Gould, percussionist Jacqueline Acevedo, and Hartford-born drummer Jonathan Barber. One should expect that the uptempo pieces will crackle with excitement while the ballads will be emotionally strong. For ticket information and reservations, call 860-434-0886. To learn more about the trumpet player, go to jeremypelt.net. 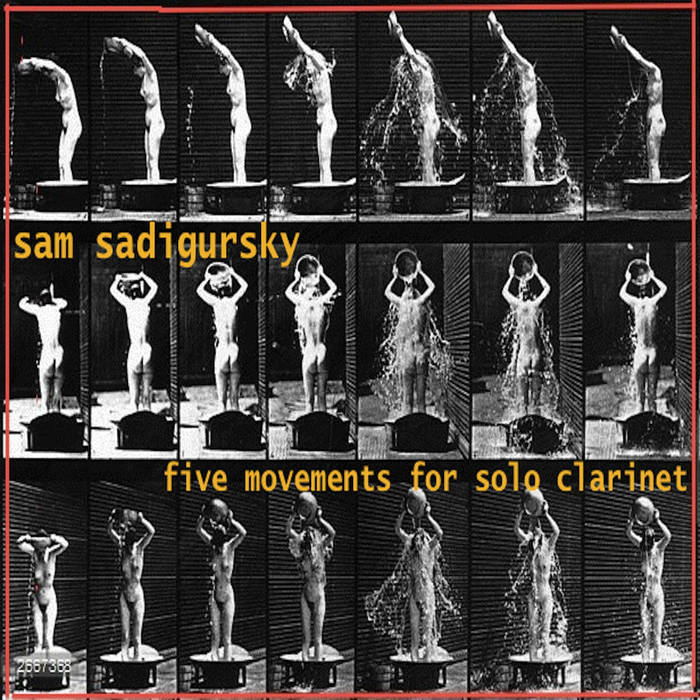 Sadigursky, who is a member of numerous groups but most notably Darcy James Argue's Secret Society, has just issued (for download only) "Five Movements for Solo Clarinet" - this time, the composer plays his music and the five track/20-minute adventure moves from the Easter European flavored "Diasporas" with its combination of long and short tones, playful phrases mixed with series of "stops-and-goes" to the classically flavored "Short Stories" and its circular lines to the Baroque-feel of "Dance On" and its alluring melody. There are also two pieces under 1:25. "Express Train" is a rush of melody as is the rollicking "Jazz Hands", the latter being as close to "jump classical" (if that's a viable term) as one could get. 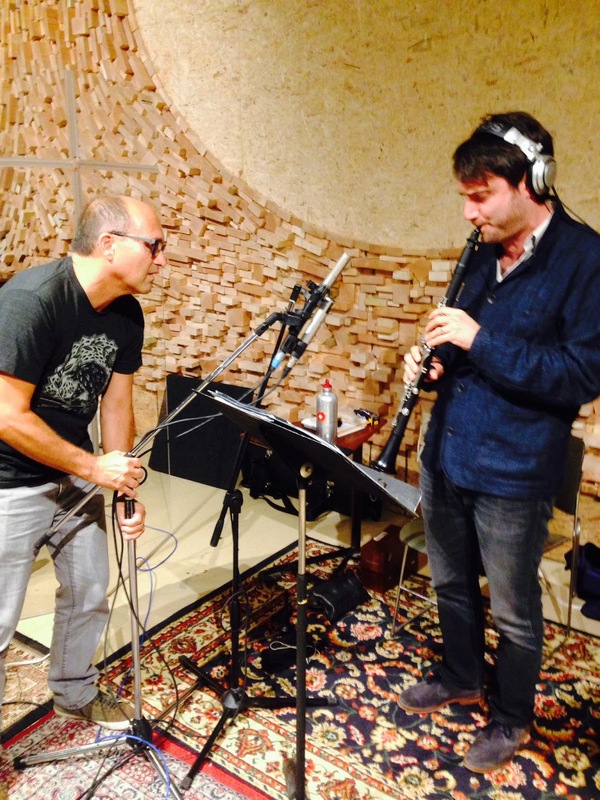 Sam Sadigursky may be best known for his various "Words Projects" plus his delightful 2015 "Follow The Stick" album but he's been seriously working on his composing for clarinet. 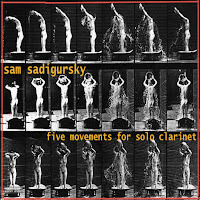 "Five Movements for Solo Clarinet" won't cost you very much money - go to samsadigurskyclarinetetudes.bandcamp.com/album/5-movements-for-solo-clarinet to make your purchase. Let the music play all the way through and then listen again. There is much music, plenty of ideas and impressive melodies, in this 20-minute adventure. This is not just for clarinet aficionados (though they should enjoy the sounds) but also for people who savor music that is bold, thoughtful, and, at times, charming. To find out more, go to samsadigursky.com. Guitarist and composer Gene Ess, a native of Tokyo, Japan, who is now a resident of New York City, has been an active musician for over three decades. After graduating from the Berklee College of Music, he began working with drummer Rashied Ali (with whom he recorded one album) and going on to work with bassists Lonnie Plaxico and Reggie Workman as well as with Archie Shepp. His first CD under his own name, "Sunrise Falling", was issued in 2003 on the ANP label. Since the 2005 release of "Sandbox and Sanctum", Ess has issuing his music on his own label, Simp Records. He has employed such great musicians as Donny McCaslin, Tyshawn Sorey, David Berkman, John Escreet, and vocalist Nicki Parrott. 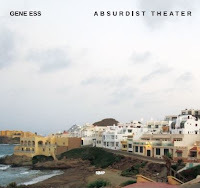 His new recording, "Absurdist Theater", is his third collaboration with vocalist and librettist Thana Alexa and second with Clarence Penn on the drums. Rounding out the rhythm section is pianist Manuel Valera and bassist Yasushi Nakamura. Ms. Alexa is an excellent foil for the guitar not just for her lyrics to his original composition (this album has eight) but also for her wordless vocals that wend their way through several songs. Valera's rich solos and strong chordal backgrounds on tracks such as "Kunai" and "Out of the Ashes" really fill the sound spectrum yet leave room for Ess's flowing guitar solos. The pianist's bell-like electric piano tones introduce "Torii" which drops into a Santana-like romp with the guitarist and vocalist on the main melody. Both Ms. Alexa and the leader deliver powerful solos over the rampaging drums and thick electric bass lines. (see the video below). "Dejala Que Pasa" is a fascinating ballad, powerful drumming over rippling piano, synthesizer swells (played by Ess), and Ms. Alexa's lovely vocal which, despite the title, is all in English. Among the highlights of this recording is the trio piece "Forkball (For Ornette)", which opens with just bass and drums before Penn joins during the opening statement of the theme. The piece changes tempo several times before dropping into a brisk "walking line" for the fine solo. The final track, "Upward and Onward", has a faster tempo and the quintet, pushed along by the splendid work of the rhythm section, concocts quite a heady brew. 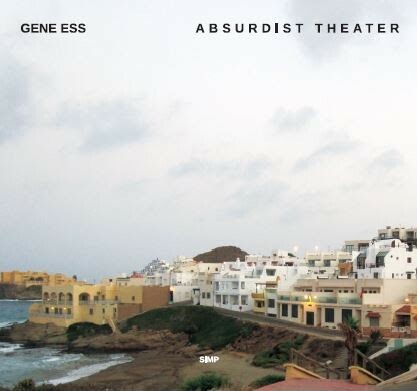 "Absurdist Theater" is a fascinating recording, a continuation of the journey that Gene Ess, his guitar, and his ensembles have been taking since he set out on his own. It's grit, melody, swing, power, and the fine voice of Thana Alexa. The album is a journey adventurous audiences should enjoy. For more information, go to www.jazzgenemusic.com. Billy "Jabali" Hart, drummer and composer extraordinaire, turns 76 this November and remains one of the busiest musicians in the world. He leads his own Quartet, is a member of The Cookers, reunited with Dave Leibman every now and then in Quest, records and plays with numerous artists plus keeps up a busy teaching schedule. 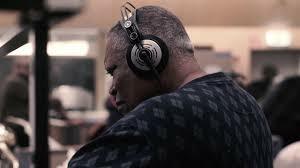 Over the decades, he has toured and recorded with Miles Davis, Eddie Harris, Herbie Hancock, Stan Getz, Shirley Horn, and a host of others musicians famous or on their way up. Mr. Hart, according to numerous sources, has only recorded with a big band once (Mingus Dynastry) and did record as a member of Lee Konitz's Nonet but never his own music. Until now, that is. The new album, "The Broader Picture" (ENJA/Yellowbird), is nearly 80 minutes long although it feels like half that length. The program features eight originals chosen from Mr. Hart's growing repertoire played an 18-piece band that includes the composer at the drums. Schweizer's arrangements often keep the drums front and center while the sections react to and "color" Mr. Hart's contributions. Surprisingly, the opening track "Teule's Redemption" (first recorded with Quest and then on "Oceans of Time" (1997 - Arabesque Records) and now on the new album by The Cookers, begins with an unaccompanied bass solo (John Goldsby) - he's soon joined by his rhythm section partner and, little by little, the sections come in. The early part of the piece sounds as if the big band is tuning up or, actually, "revving its engines" ready to let loose. If you do not know the music the drummer has created over the decades, this album is a wonderful overview. The handsome media-tempoed ballad "Layla-Joy" was first recorded on Mr. Hart's exciting 1977 debut as a leader ("Enhance" on the A&M/Horizon label) while the bouncy "Naaj" and powerful "Reneda" come from his second release, 1988's "Rah" (on the Gramavision label). These versions have a contemporary feel with arrangements that open to fine solos with sectional writing that may remind some of Gil Evans, Bob Brookmeyer, and Jim McNeely. There is no clutter even when the music "roars" which one hears on the opening track, on "Tolli's Dance", and the afore-mentioned "Reneda." Echoes of Maria Schneider's atmospheric sound move through the lovely "Lullaby For Imke", especially during the splendid alto flute solo of Johan Hörlen. There is no need to analyze each and every track. 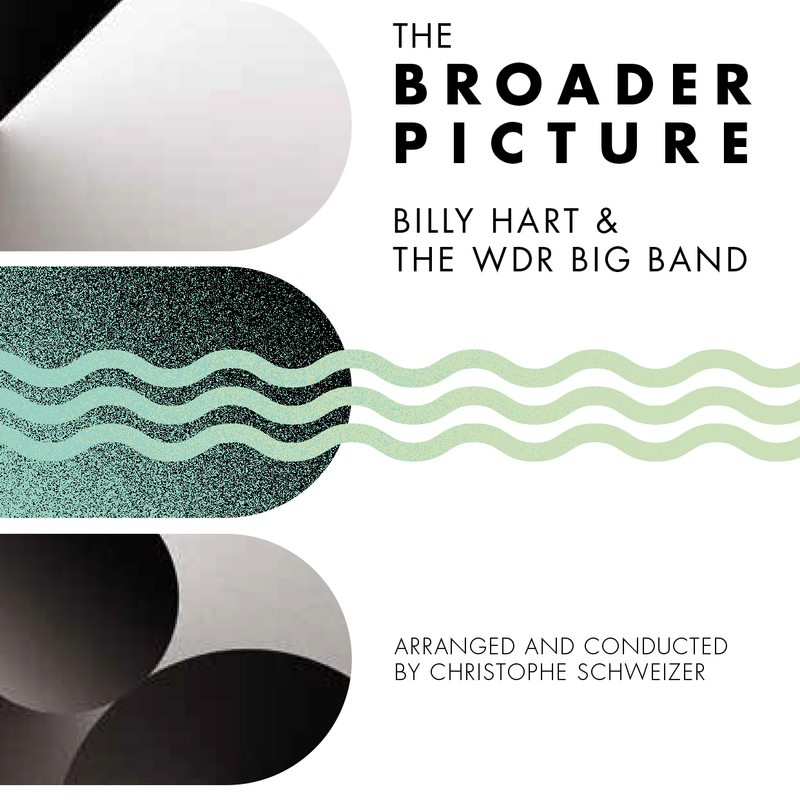 Suffice to say, if you like modern big band music, "The Broader Picture" will satisfy your needs. 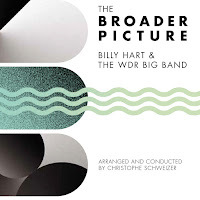 If you are a fan of Billy Hart and wonder what his music would sound like if the palette was expanded, you will be quite pleased by how Christophe Schweizer has approached this music and how he employs the WDR Big Band. In a year of superlative recordings, "The Broader Picture" stands out. Give this music the time it deserves and demands; enjoyment will ensue! The musicians on the album: Wim Both, Rob Bruyne, Andy Haderer, Rudd Breuls, and John Marshall (trumpet and flugelhorn); Ludwig Nuss, Andy Hunter, and Raphael Klemm (trombone) with Matthis Cederberg (bass trombone, tuba); Johan Hörlen, Karolina Strassmeyer, Paul Heller, Olivier Peters, and Jens Neufang (saxophones, flute, piccolo, clarinet, bass clarinet, and contra-alto clarinet); the rhythm section consists of Frank Chastenier (piano), Paul Shigihara (guitars), John Goldsby (acoustic bass), and Billy Hart (drums, compositions). 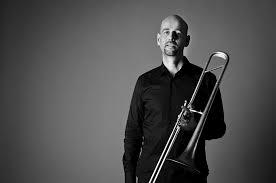 Christophe Schweizer did all the arrangements and conducted the WDR Big Band. The album will be released on September 30, 2016. The Firehouse 12 Fall Concert Series began last week (yes, it was still officially summertime) and continues this Friday September 23 (the first full day of Autumn) with the Taylor Ho Bynum 7-tette. This ensemble, featuring Bill Lowe (tuba, bass trombone), Ken Filiano (bass, electronics), Nicole Mitchell (flute), Tomeka Reid (cello), Jim Hobbs (alto saxophone), and Tomas Fujiwara (drums), is an offshoot of the cornetist's Plus-Tet that has a brand new album coming next week recorded earlier this year in front of a live audience (most of whom contributed to a campaign to support the album). This will be THBynum's first gig in the Elm City since that evening. If you've seen Bynum's groups in action, you'll know to expect the unexpected, from avant-garde to Latin-flavored romps to straight-ahead swing and more, often within the same piece. The interaction of loud and soft, high sounds and low tones, the various groups-within-the-group, is great fun for listeners who love the challenge that this music presents. There are two sets - 8:30 and 10 p.m. (separate admission for both) - and you can find out more by going to firehouse12.com or calling 203-785-0468. To fond out more about Mr. Bynum and his projects, go to taylorhobynum.com. Two more great nights of music at The Side Door Jazz Club in Old Lyme. 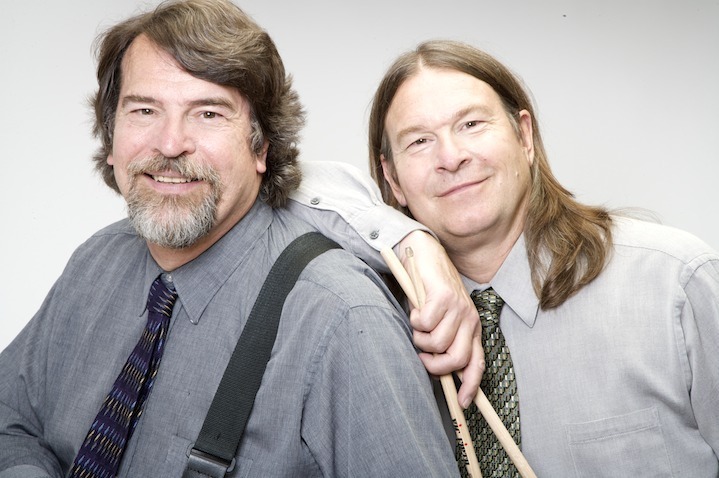 On Friday evening (9/23), the Brubeck Brothers (bassist and trombonist Chris and drummer Daniel) bring their Quartet to the venue. The group has been in existence over four decades but quite active since their father Dave passed in 2012. Not only do they play Dad's music but also are both fine composers (as our brothers Matt - cello - and Darius - piano) in their own right. Joining Chris and Daniel onstage will be Mike DiMicco (guitar) and Chuck Lamb (piano). The group's repertoire covers a wide swath of American music (no surprise considering its heritage) and will surprise and please with its variety. Doors open at 7:30 p.m. and the music starts an hour later. For tickets and more information, go to thesidedoorjazz.com. Saturday night, the Door opens (actually re-opens) for the Freddie Hendrix Quartet. The trumpeter is back, almost a year to the day he last performed at the venue but it's been quite a busy year. Not only was his debut album issued on Sunnyside Records this January but he has also performed with the George Gee Swing Orchestra plus the Big Bands of Christian McBride, Jimmy Heath, Caleb Brumley plus the Vanguard Orchestra, Arturo O'Farrill's Latin-Jazz Orchestra and the David Gibson Quintet (plus dozens of other gigs). Hendrix is a delightful player, swings with glee, and has a sweet tone (listen below). His regular touring group includes Brandon McCune (piano), Chris Berger (bass), and Chris Beck (drums). Music begins at 8:30 p.m. For more information, call 860-434-0886. To learn more about the drummer, his web address is www.freddiehendrix.com. Bassist, arranger, and composer Matt Ulery, whose trio of critically acclaimed albums of Greenleaf music (issued from 2012-14) contained an often dazzling array of styles and musicians, continues that trend with his new album, "festival" (Woolgathering Records). 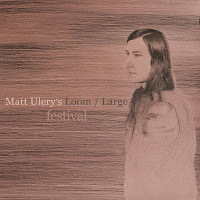 Released on his own label, the recording is credited to Matt Ulery's Loom / Large and features two different ensembles, one his regular quintet (Loom), the other a 14-piece orchestra (Large, including violin soloist Zach Brock), performing three distinct programs. The album opens with the only non-original composition on the album, an orchestral reading of Jimmy Rowles' classic "The Peacocks." Ulery's classy arrangement features Brock playing the melody and the major solo. Ulery takes a short solo over the easy brush work of drummer Jon Deitmeyer (with the trombones adding a quiet chorus) before pianist Rob Clearfield steps out front for a moment before the Orchestra returns to the main melody. Large also appears on the following track, "Hubble", a wondrous journey through several changes in dynamics that also has intelligent use of the strings, reeds and brass, sending out melodic signals throughout the universe of the song. The forceful 4/4 rhythm, the quiet interludes, strong solos from Clearfield and Brock, and the excellent arrangements for the sections makes this such an impressive work. The remaining 13 tracks feature the bassist's quintet performing two quite different programs. Besides Deitmeyer and Clearfield, Loom includes the splendid trumpeter Russ Johnson and clarinet work of Geof Bradfield. On the first six tracks, the ensemble dances and instrumentally sings its way through Ulery's melodic repertoire. It's absorbing to hear the emotionally powerful "A Family, A Fair" with its rippling piano solo and the fascinating dialogue between the trumpet and clarinet near the end. Listen to how Ulery employs all five "voices" on "Canopy", how the bass and drums also work the melody into their playing and how Clearfield's elemental piano chords holds the piece together. Johnson's work is exemplary throughout, his clear, crisp, articulation ands how he glides through the registers on pieces such as "Middle West" (with the bass clarinet as counterpoint and support) plus his forceful yet flowing journey through "Ecliptic." Matt Ulery has created his own sound, hearing a confluence of sounds and styles unlike any contemporary composer. It strikes this listener a decade and seven albums into his career that melody is his guiding principal and this his instruments are the people such as Jon Deitmeyer, Rob Clearfierld, Zach Brock, eighth blackbird, Marquis Hill (trumpet), Russ Johnson, and others who he interpret his wondrous messages. "festival" is a treat, three albums on one disc, 74+ minutes, and well worth your time and attention. To find out more, go to mattulery.com. From 1960 to the early days of the 2000s, pianist and vocalist Shirley Horn (1934-2005) was a captivating member of the music scene. She recorded a slew of albums for labels such as SteepleChase, Mercury, and ABC-Paramount but it was move to Verve Records in 1987 that really brought her international recognition. With her trio of bassist Charles Ables and drummer Steve Williams, she was a favorite of so many lovers of melody and swing. An impressive pianist, it was her voice that attracted so many fans. She rarely wasted a syllable plus each word carried a lot of weight - bless her, she knew how to swing and Ms. Horn could carry one away with her ballad. 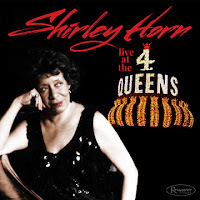 All of that is apparent on "Shirley Horn: Live at the 4 Queens", an album recorded for broadcast in the long-departed Las Vegas nightclub for radio station KNPR. Now brought to our attention by George Klabin and Zev Feldman for Resonance Records in a package that includes the company's usual group of essays from fans , critics, and participants. The program, recorded a year after she signed with Verve, opens and close with instrumentals that show one just how much fun Ms. Horn has with Ables and Williams as well as how fine an instrumentalist she was. Randy Weston's "Hi-Fly" swings in on solid chords and sprightly brush work. There's a touch of Ellington and "Fats" Waller in her splendid solo. The other non-vocal track is Oscar Peterson's "Blues For Big Scotia" and the Trio has a delightful time swinging this up-tempo blues. The seven vocal tracks range from Jobim's entrancing "Meditation" and samba-with-a-blues kick version (and vice versa) of "The Boy From Ipanema" to a lengthy take on Rodgers & Hart's "Isn't It Romantic" that opens up for all three musicians to solo. 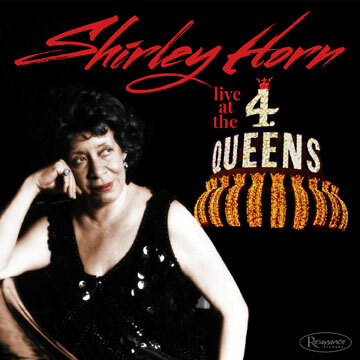 Ms. Horn was well-known for her ballads ad the two on this album do not disappoint. "Lover Man" moves quite slowly, reminding us that the song is a real blues lament. There's a hint of Billie Holiday in her vocal but pay attention to how Ms. Horn's frames and comments on her vocal. Lil and Louis Armstrong's "Just for a Thrill" is the other ballad in this set and the performance is indescribably delicious (and there's a touch Mr. Armstrong's signature "growl" at the onset of the song). Words cannot do justice - you must hear it for yourself. Do just that - listen to "Live at The 4 Queens". Think of this polished musician, vocalist, and entertainer, a polished, professional, and talented person in the midst of what was known as "Sin City" at the time. Wherever she was, Shirley Horn was herself, no one else, and we are all the luckier for the time she was here, for the many albums she recorded and all those fine gigs in clubs, concert halls, and auditoriums. For more information, go to www.resonancerecords.org/release.php?cat=HCD-2015. Here's a good overview of Ms. Horn's career - go to www.npr.org/programs/jazzprofiles/archive/horn_s.html. The Fall 2016 Concert Season at Firehouse 12 begins this Friday (9/16) with an appearance by the Ben Wendel Group. The tenor saxophonist, bassoonist, and composer may be best known for his work with Kneebody; he appeared at the Elm City venue three times including in a duet with pianist Dan Tepfer, as part of Linda Oh's Sun Pictures group, and with his friends in Kneebody. He's a busy musician and producer - I saw him recently subbing for Donny McCaslin in Maria Schneider's Orchestra and he fit in nicely with the ensemble. Wendell is touring on the strength of his new album (just came out last week) "What We Bring", his debut on Motéma Music after three releases on SunnySide Records. The recording features Gerald Clayton (piano), Joe Sanders (bass), Henry Cole (drums, and, on two tracks, Nate Wood (percussion). Clayton and Sanders will be along for the New Haven gig while Wood will man the drum set. What a delight the music is on the new album. Six originals and two fascinating covers, one of Miles Davis's "Solar" (which closes the recording) and a lovely reading of "Doubt" by the duo known as Wye Oak. From the opening moments of "Amian", the quartet (and, in this instance, Wood) are firing on all cylinders. Sanders and Cole (who is a member of Miguel Zenon's Quartet) set a throbbing rhythm while Clayton rumbles underneath. During Wendel's solo, the pianist is silent while the tenor flies above the fray. If you play close attention, you can hear the overdubbed reeds as well as the percussive piano. The melody of "Fall" rises over a funky beat. Clayton and Wendel share the melody and, at the end of the verse, they each take a quick solo turn. Clayton takes off into a rollicking, dancing, solo - when the tenor, one hears a section that is reminiscent of Keith Jarrett's European Quartet (Jan Garbarek, Jon Christiansen, and Palle Danielson) from the 1970s. One hears that in the opening of "Spring", in the sprightly melody line and how Clayton jumps into his solo over the active brushes and fundamental bass. There's a hint of Caribbean rhythm on "Song Song" while the melody dances atop the bells and bouncing bass lines (acoustic bass and Clayton's left hand). "Soli" charges out of the gate thanks to the forceful drumming yet it's quite a pleasure to hear how the four musicians vary the dynamics. "Austin" is a such a pretty piece, the articulated piano lines and the breathy tenor create an atmosphere of gentle contemplation. Clayton is the perfect foil throughout the record, his choice of notes and chords serve the songs so well and his solos are so smart. Because Sanders and Cole are so adept at creating the foundation for ever song, both the pianist and saxophonist are free to explore. The splendid interpretation of "Solar" brings the album to a close on a rousing rhythm. Just listen to how Cole pushes the piece away from its hard-bop roots and into new territory, one marked by the influence of hip hop. "What We Bring" is modern music, celebrating the tradition as it expands its territory. 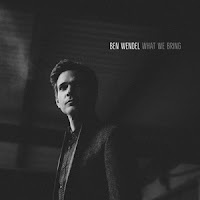 Ben Wendel has an expansive mind, attracting musicians to his vision who enjoy taking the music in unexpected and often exciting directions. This album is a delight from start to finish. For more information, go to motema.com/artists/ben-wendel/. The Ben Wendel Group plays 2 sets at Firehouse 12 with the first at 8:30 p.m. and the second (separate admission) at 10 p.m. For more information, call 203-785-0468 or go to firehouse12.com. As luck would have it, alto saxophonist, composer, and the newly appointed Director of Jazz at Princeton University, Rudresh Mahanthappa brings his Bird Calls quintet to The Side Door Jazz Club in Old Lyme on Friday night, performing his first set at the same time as Ben Wendel will be playing in New Haven. 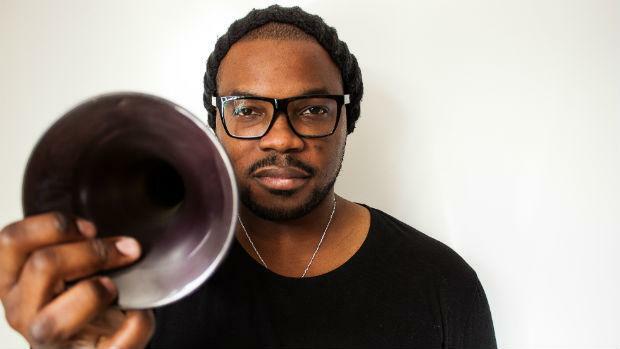 Joining him will be three of the four musicians who recorded the 2015 ACT CD that gives the band its name; they include pianist Matt Mitchell, bassist François Moutin, and the impressive young trumpeter Adam O'Farrill. Replacing drummer Rudy Royston will be Dan Weiss so there will be no loss in the powerful drive that propelled the band on the album. The music, based on the leader's study of the music of alto saxophonist Charlie "Yardbird" Parker (the subtitle of the CD is "The Charlie Parker Project"), does not sound like it comes from the 1940s or 50s but has a modern sensibility. Parker always created new songs off the chords of older ones (he loved "I Got Rhythm" for example) and Mahanthappa does the same. It's a smart approach, filled with great melodies and strong solos - this is quite a band. Doors open at 7:30 p.m. and the first notes should resound at 8:30. For tickets and more information, go to thesidedoorjazz.com or call 860-434-0886. To learn more about Professor Mahanthappa, go to rudreshm.com. On Saturday night, The Side Door welcomes back the Clifton Anderson Sextet with saxophonist Antoine Roney. The trombonist, best known for his work with his uncle, saxophonist Sonny Rollins, has always maintained a career as a leader, moreso over the past several years since his former employer has stopped playing concerts. The music starts at 8:30 p.m. Check the website for more information. As the CDs pile up on my desk, one keeps rising to the top. 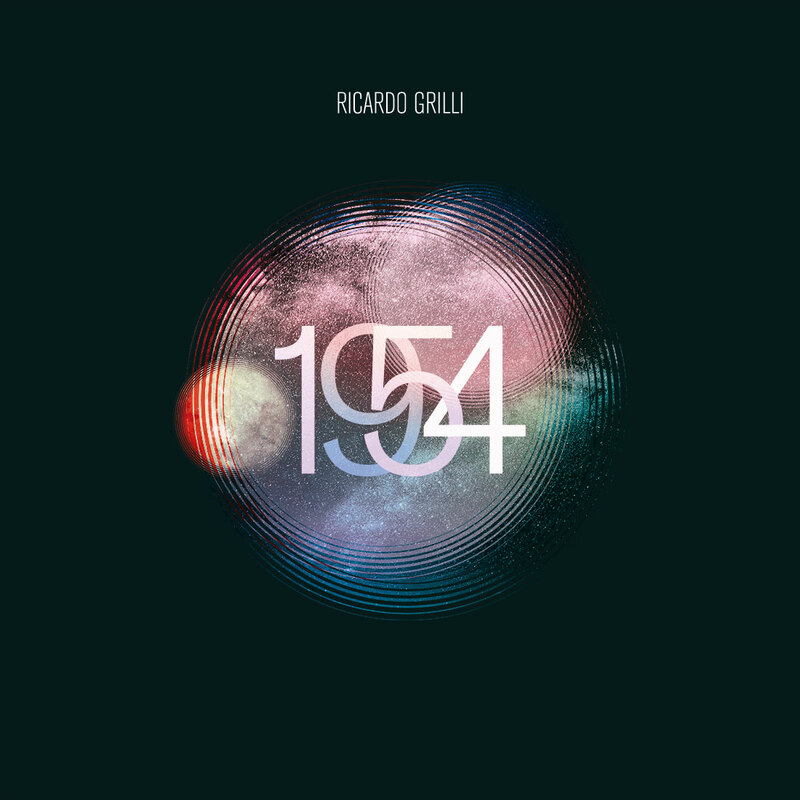 "1954" (Tone Rogue Records) is the second album for guitarist and composer Ricardo Grilli. Grilli, a native of Sao Paulo, Brazil. moved to New York City to study at NYU in its Music and Performing Arts Department (after studying at the Berklee College of Music). 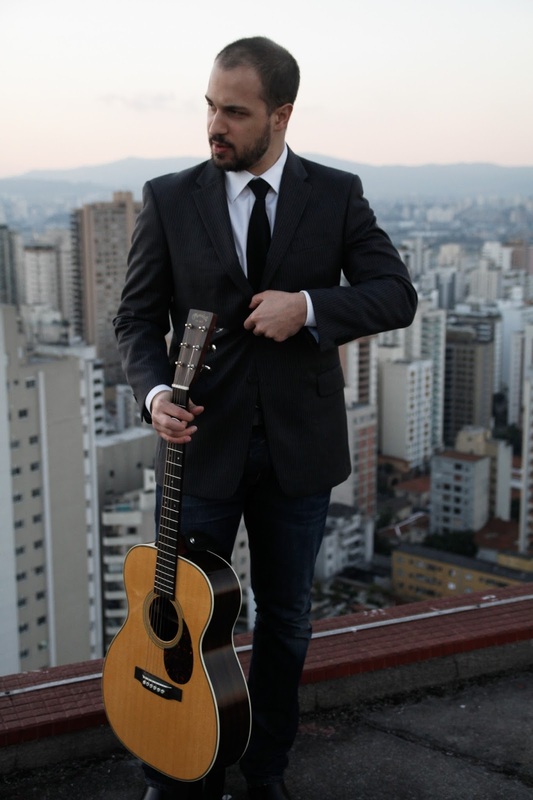 He graduated in 2013, the same year he issued his debut album, "If On A Winter's Night A Traveler" (self-issued). He's worked with pianist Jon Cowherd, saxophonists Chris Cheek and Chris Potter, and drummer EJ Strickland. He's a melodic streak a mile wide and it's very evident on both his albums. 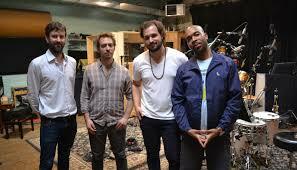 The new album features an impressive band including Aaron Parks (piano), Joe Martin (bass) and Eric Harland (drums). The guitarist has supplied with nine originals pieces and, while you may hear a hint of Pat Metheny and Kurt Rosenwinkel every now and then, these compositions are mature, thoughtful, and filled with wonderful melodies. Several of the cuts sound as if there should be a vocalist. Pieces such as "Rings" and the elegant samba "Breathe" are telling a story, one that the listener can get wrapped in. Gentle chords and simple yet effective hand drumming leads in "Rings" - nothing is rushed, the melodic bass lines underpinning the melody played by the leader and Parks, whose phrases rise over the guitar lines and loops. "Cosmonauts" has a classical feel with Martin's sweet solo right at the beginning as the piano plays quiet figures that lead into the melody, one that is effortless and poetic in nature. Harland helps to push the melody forward with his active work while his cymbals splash easily during the piano solo. There are also moments when the music takes a harder turn. The opening track "Arcturus" (possibly named for the red-giant star in the Boötes constellation) has a strong 4/4 feel in Harland's drums, a pulsating drive that one might hear on a Jeff Beck track (not the guitar sound, though). "Vertigo" features a solid drum attack yet still has a well-turned melody. Harland keeps up the intensity during the piano solo but does not overpower Parks. 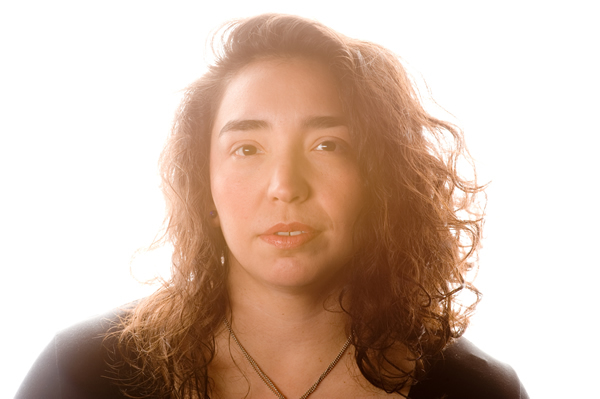 Grilli feeds off the the drummer's energy and creates a ringing solo, filled with powerful phrases that rise and fall and rise again. There's a "prog-rock" feel to the drums on "Radiance", a tune on which the sustain of the guitar notes give the song a fuller sound. The program closes with "Pulse", a rapid-fire tune that has a hard-bop feel, flying on the scrambling drums and "running" bass lines. Parks digs into his solo, urged on the forceful rhythm section and chunky guitar chords. Get a copy of "1954" (it's released in early October) and let the sounds and melodies wash over you. Don't look for influences, just listen and you'll hear a confident musician playing with a rhythm section that supports, pushes, and gives its all. Notice the melodies - the majority are truly intelligent, well-drawn, and not flashy guitar riffs that lead to long solos. Ricardo Grilli, remember that name. Judging by his 2 albums, he's a fine composer, a smart player, an excellent arranger, and, chances are good, he'll be making great music for a long time. For more information, go to www.ricardogrilli.com.